Cheese biscuits, such as oatcakes or Dr Karg's Classic Crispbreads. Cut a selection of crudités, such as 2 carrots, ½ cucumber and ½ bunch celery, into batons and slice 8 radishes in half. To transport, place the crudités in a plastic food bag, seal and chill. Keep all other ingredients in their packaging. 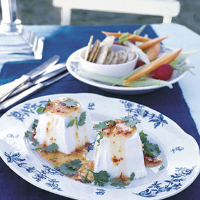 Turn out 2 x 150g tubs Chavroux Fresh Goat's Cheese onto a platter and drizzle with 6 tbsp Blue Dragon Sweet Chilli Dipping Sauce. Sprinkle with ½ x 20g pack fresh coriander, stalks removed. Serve immediately with the selection of prepared crudités and your favourite cheese biscuits, such as oatcakes or Dr Karg's Classic Crispbreads.